by Sarah Foskett, University teacher. Frances, Anita, Karen and I were delighted to be present at the graduation of the 2012-2014 cohort of students, Maria Grabowska Armstrong, Emily Austin, Rosie Chamberlin, Melissa Bolin, Moe Sato, Emma Schmitt and Alice Young, from the programme on Monday 1st December and to celebrate with them the attainment of their MPhil Textile Conservation degrees. It was both a pleasure and a privilege to be able to share in their success and to see those able to attend rewarded for all their commitment and hard work. Graduation is always an uplifting occasion and this year was no exception. The Bute Hall never fails to provide a suitably impressive backdrop and the time honoured tradition of the ceremony itself perfectly complements the sense of occasion. The atmosphere inside the Hall was tangible and charged: with the students feeling a mixture of expectation and excitement (and probably a little relief and disbelief too) and the parents, partners and friends filled with pride and admiration (and probably a little relief and disbelief too!). The Chancellor of the University, Sir Kenneth Calman, presided over the ceremony, ‘capping’ each graduand individually as they had their hoods put into place and received their hard earned and well deserved degree certificate. After the ceremony itself, the gloomy Glasgow afternoon was completely transformed by the colourful sight and sounds of students in gowns and newly donned hoods parading around the quad led by the procession of academics and university officials before being reunited with their guests for further celebrations. In his speech, Sir Kenneth Calman talked about graduation as defining a transition: a transition in which expectations are raised by success and achievement. For this year’s graduates that transition is already well under way as they are all currently employed as textile conservators: a further testimony to their skills and attributes. We wish them all much continued success and hope that they will keep in touch. 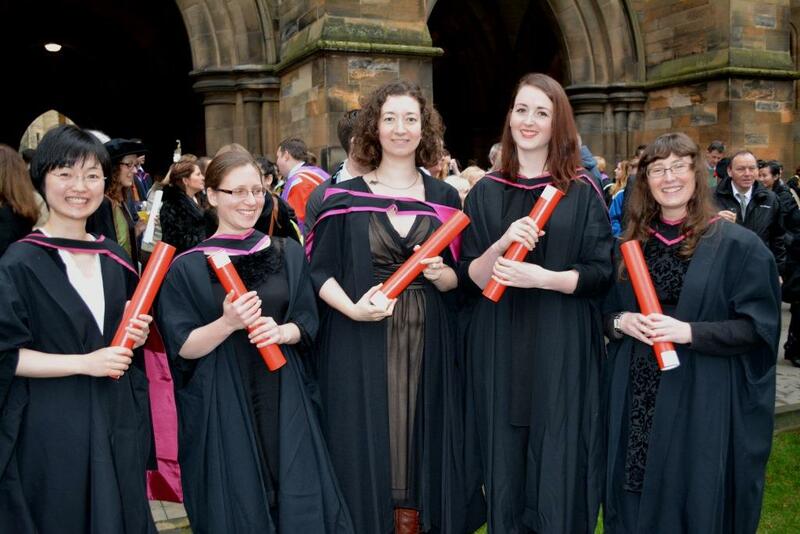 Congratulations too to all those successful students on other postgraduate programmes in History of Art.